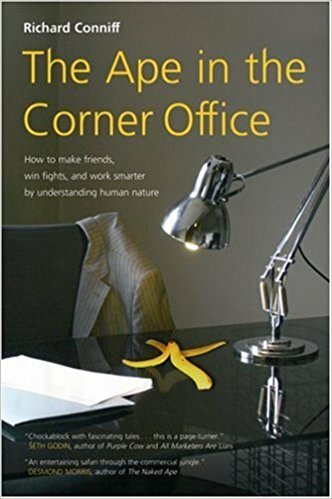 Book Review – The Ape in the Corner Office: How to Make Friends, Win Fights, and Work Smarter by Understanding Human Nature’ by Richard Conniff. Another oldie I finally got around to reading and another goodie. The whole book is very interesting and entertaining and Conniff mixes some incredibly complex human motivations and funny anecdotes to make his points. He quotes Sapolsky and Ekman quite a bit, unavoidable as they are out front in their respective fields, and whilst he does not mention Navarro and Haidt there is clear overlap. I really enjoyed the use of primatologists research findings and observations throughout and am now a source of entertaining monkey stories for my grandchildren. On a more serious note there is good science explained clearly, I particularly found the thought on ‘The Right Hand Man (or Woman). From a conflict management perspective the physiology of dominance contests was fascination, I knew quite a bit of this anyway but here it is really well presented. Upon completion I found it confirmed my business and social practices, I am pro-socially dominant and bi-strategic. Bi-strategics use prosocial techniques by reciprocating favours, offering help without being asked and they build alliances. However, I am not averse to coercive behaviours to get my way, yep, no more Mr Nice Guy if being a Nice Guy fails. This is a book where reading a chapter at a time is a great strategy although I did get carried away a few times. It is a topic that I am thoroughly fascinated with so it is not surprising I am recommending it. If you are only going to read 1 book on why we behave as we do, then for now, this is a good source. The thing is I suspect if you read it you will want more.